Infrastructure is essential to economic growth and prosperity. This story is from Blake's Take, an independent political blog. I write today with strong motivation. I have such strong motivation because I almost popped my tire on the way home from work yesterday. Infrastructure. It needs help. We need to help it. It's quite sad. Our roadways, bridges, and even our locks and dams are in desperate need of repair. I think this is something we can all agree on no matter what our political beliefs are. I think this is an agenda item that any constituent would appreciate. And still..we can't seem to get anything done. Let me address and make clear the problem really quick. 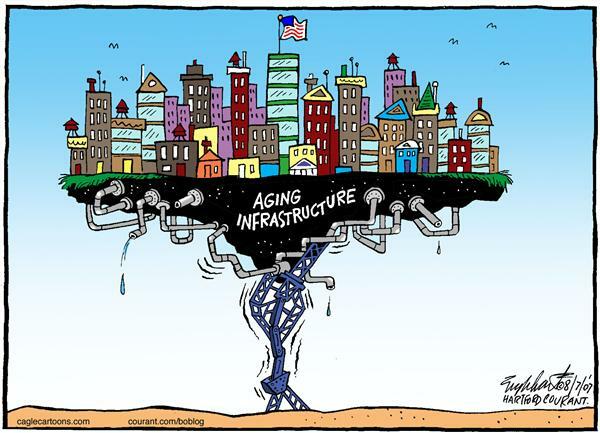 Our infrastructure is failing because of many years of high demand and advancing age (it's old). And, no one wants to pay for it...surprise surprise. And, when someone actually does want to pay for it, there are so many laws and regulations in place that prevent a project from ever being easy. What does anyone actually want to pay for these days? I'm sorry, let's stop with all the negativity, Trump is about to achieve peace in North Korea...again, that's beside the point. Let's talk about the positives, what can strong Infrastructure do for us? Strong Infrastructure allows for the smooth and efficient movement of products and people around the United States and overseas every single day. This is what made and continues to make us strong and gives us the leg up that we have enjoyed over the years. This is a leg I don't want to lose. Strong infrastructure leads to a better quality of life for all Americans. When roadways and airports are, for example, in good shape people want to travel more. When people travel more, they spend more money. It's common knowledge, when more money is spent, our economy sees a boost. We need more of that these days. This is how we keep our advantage. A robust, growing economy is something that can be easily achieved with strong infrastructure because things just work and things just flow. Take a look back in history, it's a proven fact. Let me give you a quick example, when a farmer grows a bushel of corn, strong infrastructure allows him to get that bushel of corn out of his land and to market. Failing infrastructure, like Locks and Dams, not only make it more difficult to transport things like grains out of our farmers fields, they make it way more dangerous. This can be said for just about any other type of infrastructure. Things are so bad that it is becoming a safety issue. It's time to stop putting on band aids because even the strongest can't hold anymore. Follow Blake's Take on Twitter here. Follow Blake's Take on Facebook here. President Donald Trump said his much-hyped infrastructure will likely have to wait until after this year's midterm elections.